Dosing Pump is a special pump to inject chemically scalable and accurate and safe for various applications. Available with major brands such as: LMI Milton Roy, Injecta, and AILIPU or customized to customer's specific request depending on the needs of the application. Dosing Pump is equipped with liquid discharge regulator issued so that mixing materials with solvents can be accurate dosage. 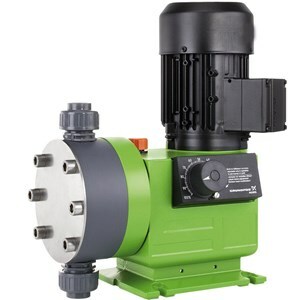 This type of pump has another name of chemical injection pump and metering pump. It is a pump that can inject certain liquids (chemicals and other materials) into other solvent fluids that are generally water. PT. Tirta Amertha Selling Dosing Pumps commonly used in food or beverage manufacturing processes on an industrial scale usually utilize chemical reactions between one material and another. How it works is to draw a chemical liquid with a certain amount and then menginjeksikannya to solvent with a certain dose. The solvent used may be water, gas, or steam. Actually the application of this type of pump is not limited to the process of making food or drink, for example for the provision of fertilizer in plants or pesticides with the right dose and efficient. It is also used in water treatment to separate water from hazardous materials by utilizing the reaction of certain chemicals to be environmentally friendly waste or for consumption needs. Not only exclusively used for industrial purposes, we sell Dosing Pumps that you can use to work on a smaller scale such as simply adjusting the pH levels of water by injecting certain chemicals, or to inject chlorine to kill bacteria for sterile water.